Packets could be dropped by Firewall when CPU cores, on which Firewall runs, are fully utilized. Such packet loss might occur regardless of the connection's type (for example, local SSH or connection to Security Management Server server). To help mitigate the above issue, Firewall Priority Queues feature was introduced in R77.30 Security Gateway. Note: The Firewall Priority Queues are disabled by default. The Priority Queues (PrioQ) mechanism is intended to prioritize part of the traffic, when we need to drop packets because the Security Gateway is stressed (CPU is fully utilized). In Security Gateway R77.20 and lower versions, when the CPU became fully utilized, part of the traffic was dropped regardless of the traffic type. As a result, control connections (described below) were dropped. This had serious negative impact (e.g., no SSH connectivity). In addition, several "heavy" connections could cause high CPU load on the Security Gateway and cause issues for all other connections. Prioritizing control connections over data connections. Each connection of the same priority will get an equal share of CPU resources. Security Gateway R77.30 / R80.10 and above "protect" the CPU cores, on which the Firewall is running. 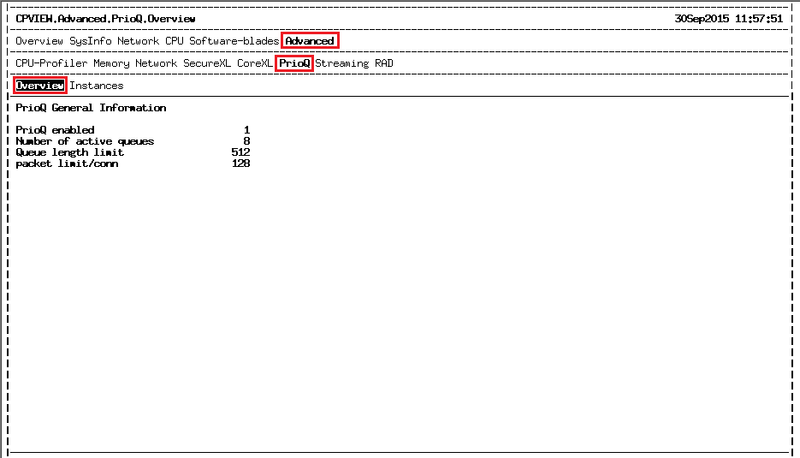 It is important to notice the differences between Firewall Priority Queues (PrioQ) and the QoS Software Blade. 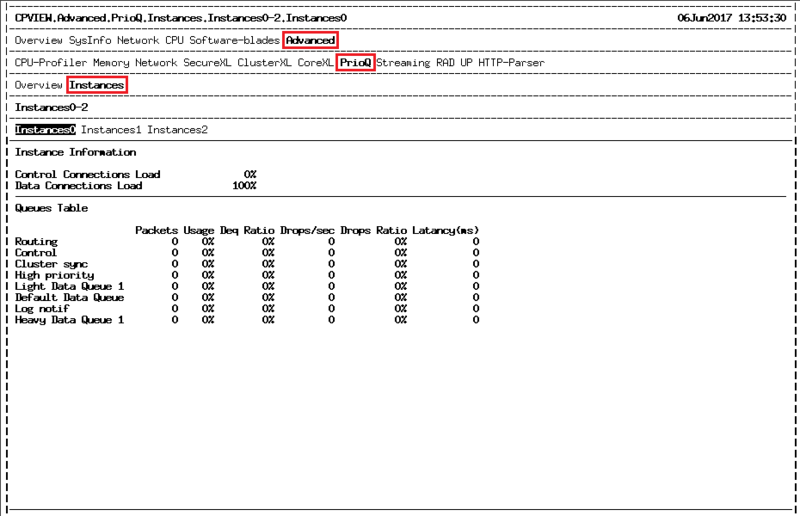 Firewall R77.30 / R80.10 and above assign higher priority to control connections than to other connections. Not all control services get the same priority. Firewall R77.30 / R80.10 and above prioritize some control services over the other control services. By default, there are 8 priority queues (up to 16 by manual configuration). The priority queues are active when the Firewall consumes 100% of CPU. When a packet of a new connection arrives, the connection is classified in order to know to which queue it is supposed to go. For example, packets of a new data connection will go to the default data queue. The Firewall priority Queues are enabled in the active priority mode: Initially, each connection is assigned to a queue by the connection type: Routing, Control, Data, etc. Nevertheless, for some connection types, the connection might migrate to a different queue. We know what is the load of each connection all the time, so the connections can migrate between the queues, and by doing so get lower/higher priority with respect to other connections. For example, a data connection begins its life in the Default Data Queue (Queue #5) and if this connection becomes heavier, it will migrate to a lower priority queue (Heavy Data Queue - Queue #7). Same is true vice versa. If a connection becomes lighter, it will migrate to a higher priority queue (e.g., Light Data Queue - Queue #4). To decide whether a connection should migrate or not, the Firewall keeps the load of the average connection all the time. For each connection (by its type), the Firewall knows to how many queues the connection was assigned and what is the CPU load caused by this connection. Based on that information, the Firewall matches weight to a queue, so that the average connection will belong to the median queue (out of all possible queues for the connection type) and each queue has an equal share of weights. 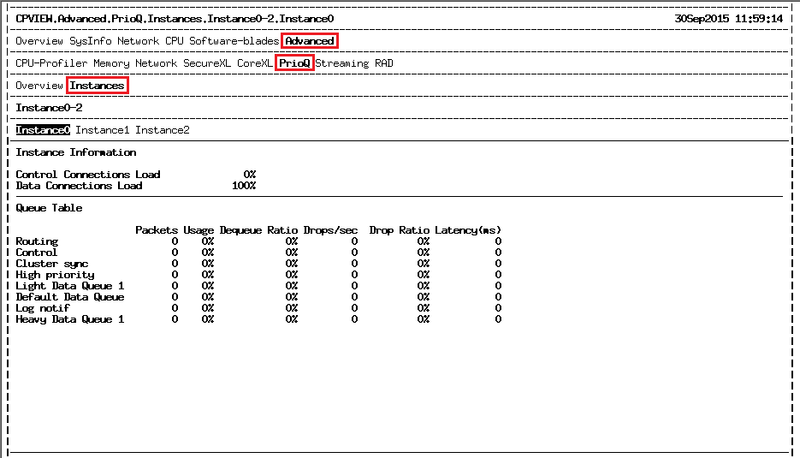 In R80.20, in VSX mode, the Firewall priority Queues are enabled in the static priority mode. This means that after a connection was classified to a specific queue, it cannot migrate to a different queue (classification is done only according to the connection type and not according to the load of the connection). For instructions on how to install and disable the Firewall Priority Queues, refer to Installation/Disablement of Priority Queues and Evaluation of Heavy Connections Mechanism. 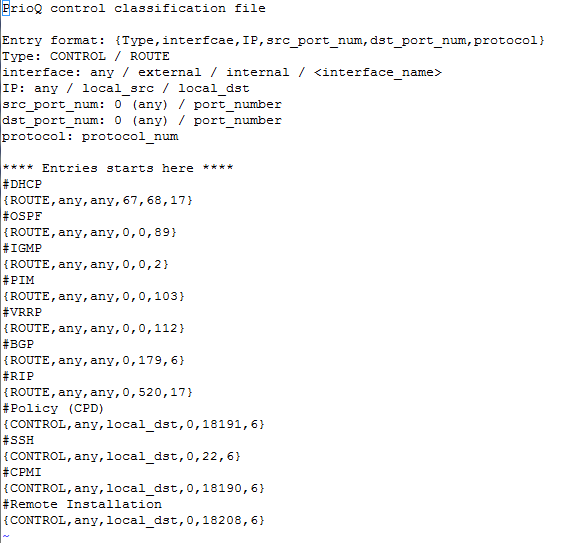 prioq.conf is a customized classification file. Type CONTROL / ROUTE To which queue the rule refers. any / external / internal / <interface_name> On which interface the rule will be. IP any / local_src / local_dst Which kind of connections. Source Port Number 0 (any) / port_number Source Port Number. Destination Port Number 0 (any) / port_number Destination Port Number. Protocol Number protocol_num Protocol Number. Administrator can monitor the Firewall Priority Queues in the following ways. Note: Firewall Priority Queues on Security Gateway must already be enabled. Refer to Installation/Disablement of Priority Queues and Evaluation of Heavy Connections Mechanism. Use the sk101878 - CPView Utility. Provides general information about the priority queues and information per instance including the priority queues of the specific instance. Note: When CPU cores are not fully utilized, all values on this screen will be 0 (zero). 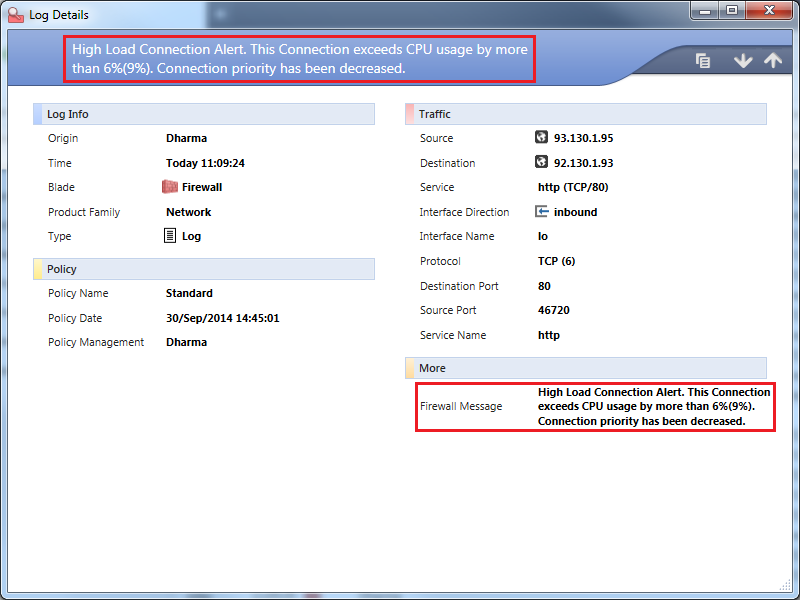 Use SmartLog (supported only for Dynamic PrioQ). A log is issued for every Heavy Connection (that consumes more than 10% of the CPU resources) that such connection was detected and its priority is decreased. Refer to the Configuration Limitations section. Note: Firewall Priority Queues and Evaluation of Heavy Connections mechanism are disabled by default. Before enabling these features, refer to "Limitations" section. Firewall Priority Queues and Evaluation of Heavy Connections are completely disabled. 9 On Firewall Priority Queues feature and connection statistics feature (in cpview) is fully enabled. Note: This mode also fully enables the CoreXL Dynamic Dispatcher (refer to sk105261). Note: In cluster environment, this procedure must be performed on all members of the cluster. Reboot (in cluster, this might cause fail-over). In R80.10, Firewall Priority Queues are disabled by default. Starting in R80.10, configuration of Firewall Priority Queues and CoreXL Dynamic Dispatcher were separated and are no longer related to each other. 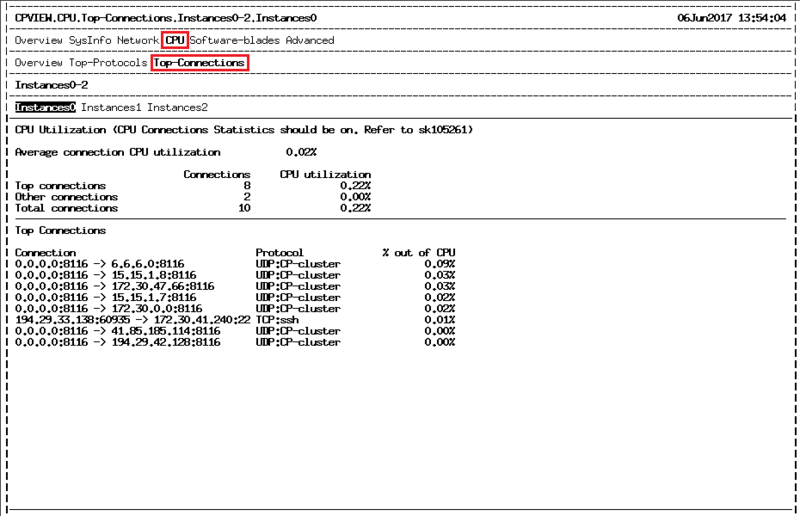 (that consume the most CPU resources) is enabled in CPView Utility. 2 On Firewall Priority Queues feature is fully enabled. Choose the mode number 2 "On". Notes: This mode is not supported when Security Gateway is configured in VSX mode. In cluster environment, this procedure does not have to be performed on all members of the cluster because it enables monitoring only. Choose the mode number 1 "Evaluator-only". Choose the mode number 0 "Off". "Evaluator-only" mode is not supported. The Evaluator of Heavy Connections mechanism is not supported. Firewall Priority Queues is supported in static priority mode only (see "Explanation about Priority Queues" section). Some lines in the $FWDIR/boot/modules/fwkern.conf file are commented out (refer to sk106309). When SecureXL and a CoreXL FW instance are running on the same CPU core, Priority Queues and Top Connections may not function as expected. 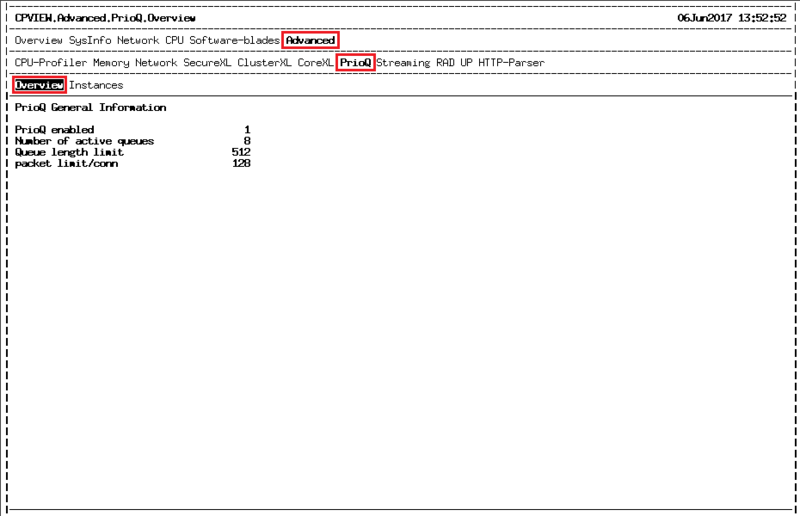 Such a configuration is the default on the 2200 appliance and on the 4600 appliance. To resolve this, disable the synchronous dequeue feature in CoreXL by permanently setting the value of kernel parameter fwmultik_sync_processing_enabled to 0 (zero). This feature allows the administrator to monitor the Heavy Connections (that consume the most CPU resources) without interrupting the normal operation of the Firewall. After enabling this feature (refer to Installation/Disablement of Priority Queues and Evaluation of Heavy Connections Mechanism), the relevant information is available in CPView Utility. For detecting Elephant connection, refer to the Elephant Connection Detection Mechanism. 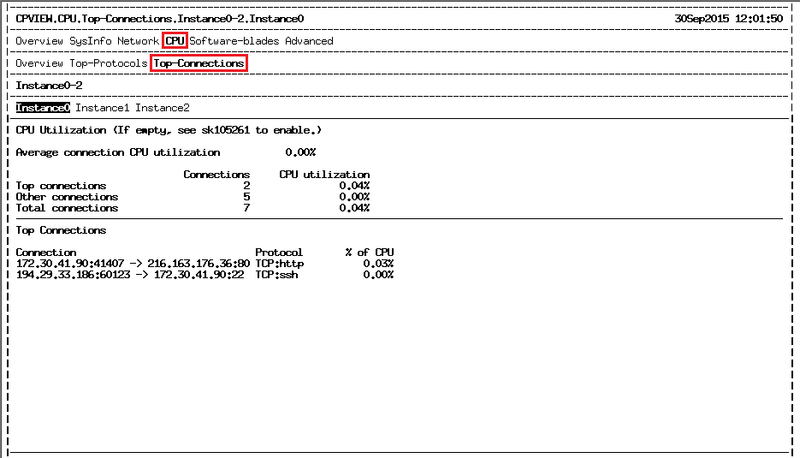 Note: This feature is not supported in VSX mode for all versions (R77.30/R80.10/R80.20). For installation and disablement of the Evaluation of Heavy Connections mechanism, refer to Installation/Disablement of Priority Queues and Evaluation of Heavy Connections Mechanism. Go to CPU -> Top-Connections. This screen displays top 10-30 (configurable) connections that consume the most CPU resources. Note: This log is supported only for Dynamic PrioQ. A log is issued for every Heavy Connection (that consumes more than 10% of the CPU resources) that was detected and its priority is decreased. Refer to Configuration Limitations section. In R80.20, a heavy connection detection mechanism was added for Kernel mode FW only. Every connection which fulfills the following 3 conditions will be considered as a heavy connection flow and will be reported. Identifying elephant depends only on the specific instance related to it. The system saves heavy connection data for the last 24 hours and CPDiag has a matching collector which uploads this data for diagnosis purposes. On the system itself, heavy connection data is accessible using the command: "fw ctl multik print_heavy_conn"